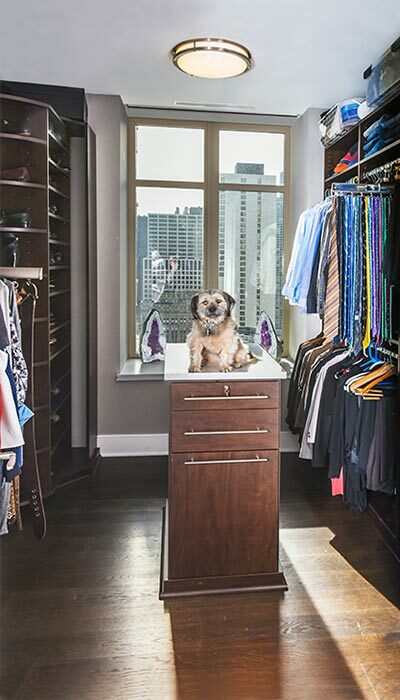 This condo closet is definitely Top Dog when it comes to storage and amenities within a small space. The design includes hanging areas for his and her clothing with numerous pull-outs for organizing belts, scarves, ties, pant racks and a valet pole. Using these telescoping pull-out closet accessories allows for more items to be stored in an easy access manner within a smaller space. Shelving on "his" side of the closet organizes a large sweater collection, while a hutch unit on "her" side with reeded glass doors provides ample storage for handbags and small accessories. The reeded glass on the upper cabinet keeps items visible, but offers a less cluttered look by screening contents. The drawers keep small accessories and jewelry organized. 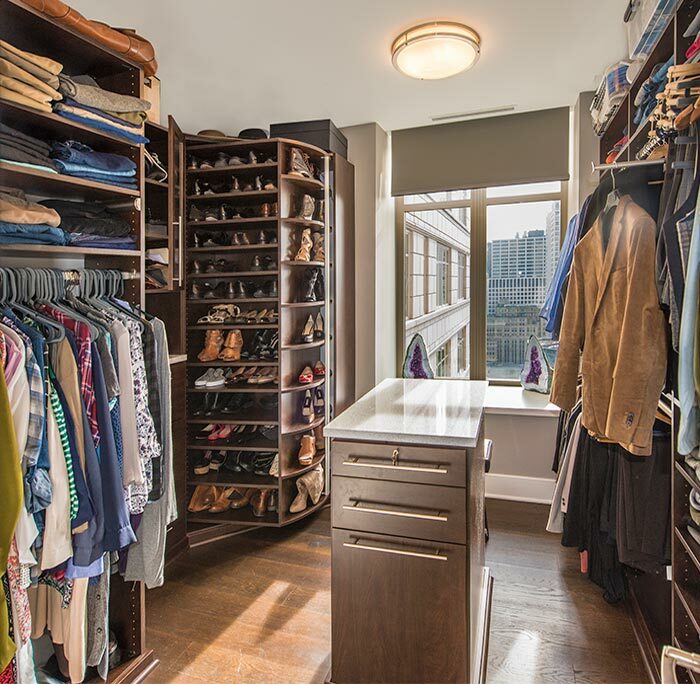 The pièce de résistance of this condo closet is the custom shoe organization system — The 360 Organizer® Shoe Spinner holds between 85 and 200 pairs of shoes on a rotating base, allowing a large collection of footwear to be easy to store and find without using much space. A small closet center island occupies the middle of the walk in, dividing the space into "his" and "hers" sides, while providing a favorite perch for the family dog to effectively survey his realm and keep an eye on all comings and goings.